Measurements: 3.75 x 5.5 inches, or 95 x 140 mm. Large, also, uncoated. Back of card: Wavey, fabric looking lines, primarily orange in color. Not symetric, but you will not notice, so may be inverted. Booklet included: Yes, a small book, actually. 78 pages, 3.75 x 5.5 inches, or 95 x 140 mm. Properly bound, but not illustrated. Text by Margarete Peterson, introduction by Luisa Francia, translated by Manfred Miethe. Publisher: Konigs Furt (king's castle?). Printed in the EU, which I think means Germany. Packaging: A nice sturdy box with a lid. Comments: Judging by the introductory notes, Margarete Peterson is a hypersensitive painter who has lived in Bavaria, Switzerland and, finally, in Berlin. 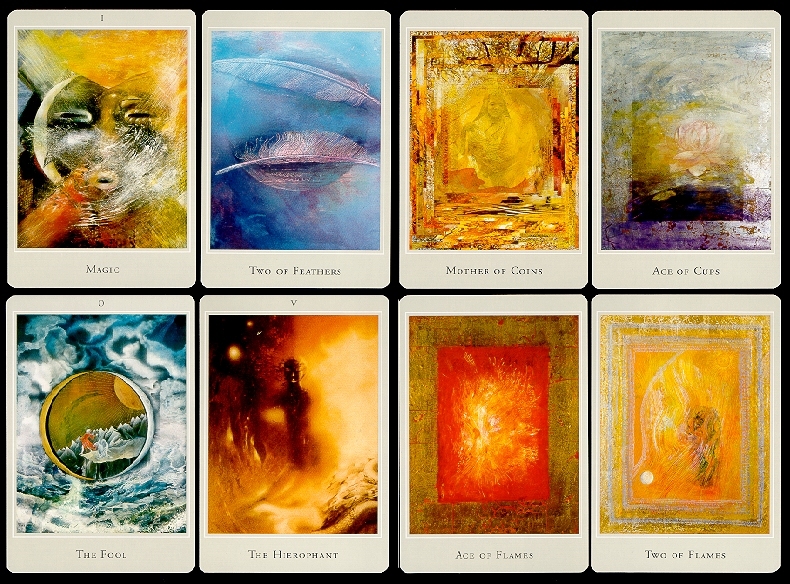 She has been painting tarot & tarot-related images since 1979, finishing the deck in early 2001. Court cards are Mother, Father, Son & Daughter. Suits are Flames, Feathers, Coins & Cups. There are some minor semantic changes in the major arcana. Don't know about you, but I need concrete images on tarot cards. Vaguely swirling colors go right past me. The deck is packed in a light gray box with gold lettering. In the center of the box is a round circle with only the center circle from the Fool shown on it. That might give you the impression that most cards in the deck would be similar. Most of them are not.